Woodward has been UW's athletic director since 2008. Washington athletic director Scott Woodward is leaving UW for the same position at Texas A&M, a source has confirmed. Woodward, a Louisiana native and a graduate of LSU, has been the athletic director at UW since January 2008. At Texas A&M, he will be reunited with former UW president Michael K. Young, who took over as the Texas A&M president last May. One source close to UW said two internal candidates for the job will likely be senior associate athletic directors Jennifer Cohen and Stephanie Rempe. Woodward’s tenure with the Huskies will be noted for his hiring of two football coaches — taking a chance on young offensive guru Steve Sarkisian and then five years later luring Chris Petersen away from Boise State — and for the $282 million reconstruction of Husky Stadium, completed in 2013. Woodward was hired at UW by Mark Emmert, now the NCAA president, with whom Woodward had worked at LSU. At Texas A&M, Woodward returns to his Southeastern Conference roots. Woodward regularly vacations in Louisiana, and one source close to Woodward said he has been exploring opportunities in the South for more than a year. Woodward is passionate about football and, according to an athletic department source, enjoyed being intimately involved in football-related decisions during Sarkisian’s run from 2009-13. Woodward was lauded for hiring Petersen away from Boise State in December 2013, but under Petersen the athletic director has been less involved in the day-to-day operations of the football team. In an interview with The Times in August, Woodward said expectations for UW teams — and for the football program in particular — are to be national players. Woodward’s salary at UW was about $692,000. In his first year at UW, Woodward faced a $2.8 million shortfall in the athletic department budget, forcing UW to eliminate both men’s and women’s swimming programs and lay off 13 employees. That year, the football team also hit rock bottom, going 0-12 and prompting Woodward to fire Tyrone Willingham in late October 2008. UW’s athletic budget has stabilized some since Woodward’s first year, with revenues of $107.2 million reported for 2014-15. Revenues were boosted in part by the Pac-12 Conference’s television-rights deals and by UW’s naming-rights deals with Alaska Airlines. Contributions to the athletic department more than doubled, from about $12.6 million in 2008 to $26.6 million by 2013. 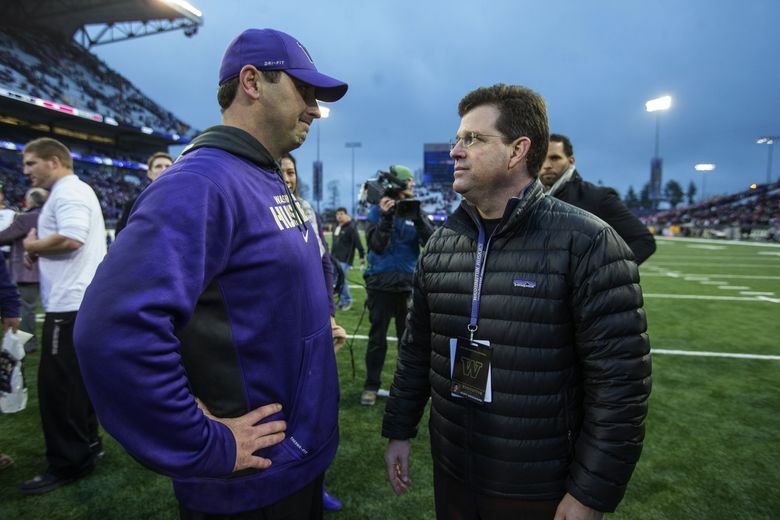 Still, UW’s athletic department budget has been strained by a steady decline in tickets sales for football and men’s basketball, by rising salaries for coaches and by the liberalization of NCAA rules, among other expenses. During Woodward’s time at UW, the Huskies won national championship in softball, women’s cross country and men’s and women’s crew. Woodward’s last major decision at UW was a controversial one — the firing of legendary crew coach Bob Ernst two days before Thanksgiving. An athletic department spokesman had no comment on Woodward’s impending departure Wednesday.